Chihuly at Cheekwood is a glass blown masterpiece. 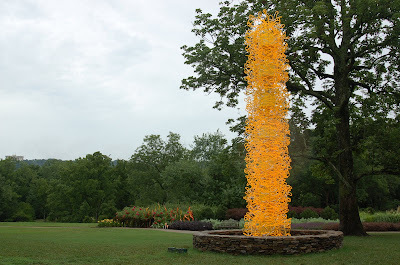 Chihuly has created a stunning landscape by incorporating his art into the gardens at Cheekwood. His art of glass blowing takes so much more than most art. Every piece of his art has to be perfectly orchestrated in order for the image to be created. Planning and construction are a major part of his art. Chihuly's art isnt just free-thinking it takes a lot to create something so extravagant. As you walk through the gardens you experience Chihuly's art at full blast. The glass is discreetly blended into the beautiful plants of Cheekwood but you could never miss one of his pieces when walking through. The bright colors make the glass explode from the green of the plants. Each piece is modeled after the plant that it sits in. Only a few pieces sit alone and those are the pieces that are large in size and in impact. Other pieces of glass sit in boats and in sand gardens but each piece is meant to blend in with its surroundings. Each piece of glass is like nothing else, only mocking its surroundings with great exaggeration. The electrifying colors and delicate extremities fuse together to create something amazing. Chihuly's blown glass has livened Cheekwood's gardens with its extraordinary beauty.